Teaching Artist Guild A national community for professional teaching artists across all disciplines. Among their many valuable resources are the Teaching Artist Asset Map (an online growing database of individuals, organizations and programs related to art that is organized by geographic area) and their online database of Training and Professional Development Opportunities for Teaching Artists. 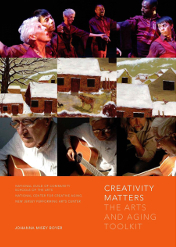 Creativity Matters: The Arts and Aging Toolkit, 2007. This is a very helpful resource that is available in print for purchase through the National Guild of Community Schools of the Arts, or for free as an electronic version online. Helpful topics include: Understanding the Context for Arts and Aging Programs, How Arts Participation Benefits Older Adults, Effective Practices , Program Design, Program Implementation, Developing Evaluations, Raising Public Awareness.